It's official. 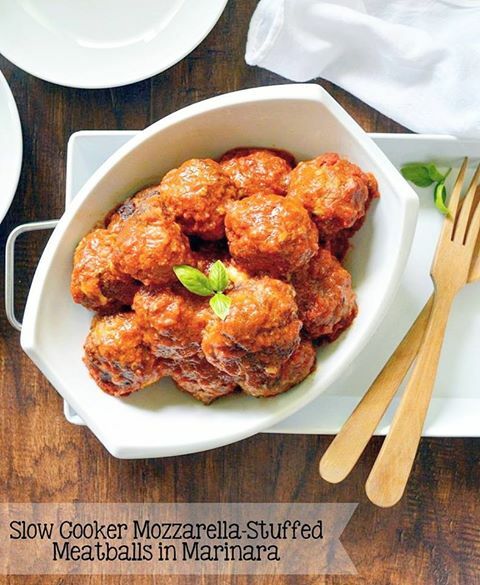 I am in love with cheese-stuffed meatballs prepared in the slow cooker. They cook up so incredibly mouth-watering juicy and tender. And, they are oozing with cheese and packed full of flavor. There are a lot of options when it comes to this recipe with regards to both how it is served and how it is prepped. The recipe, first of all, calls for both ground pork and ground beef, but you can simply choose all beef. Or, you can even go a healthier route by using ground turkey or chicken (although using turkey or chicken may result in a somewhat drier meatball due to the lack of fat content). Regarding service of the meatballs, you can devour them as-is, use them for meatball subs, serve them as appetizers (just make them smaller and use smaller chunks of cheese inside) or serve over pasta with extra sauce. As far as some prep options, you can assemble just prior to browning the meatballs and cooking in the slow cooker (as the recipe is written). Or, the meatballs can be assembled the night before you plan to cook them. Just place them in the fridge in an airtight container and brown them up just before tossing into the slow cooker. However, meatballs are a great freeze-ahead item. I often assemble meatballs, place them on a baking tray, freeze until solid and toss them into a zip-top freezer bag. Just thaw them a bit prior to using. I do find that I prefer any homemade meatballs to be chilled in the fridge a bit (prior to cooking) even if I'm assembling them the same day as cooking. It firms up the meatballs so that they hold together well when browning. And, it allows time for the flavors to meld. See .. I told you I would give ya lots of options. Now go run and make these meatballs (or, at least, get these ingredients jotted down onto your shopping list). You won't regret it. Yields 14 - 16 large meatballs. In a medium mixing bowl, combine all of the ingredients EXCEPT for the mozzarella, olive oil and marinara sauce. Form into 14 - 16 large balls. Use your thumb to press a hole into the center of each meatball. Press a chunk of mozzarella into the hole of each meatball. Close up the hole by forming the meatball mixture around the opening to seal the cheese inside. Heat the olive oil in a large sauté pan. Brown off the meatballs on all sides, but do not cook through. Transfer meatballs to the slow cooker. Cook on LOW for 4 - 5 hours. See opening of this post for serving options. 07/23/17: Updated photos and made clarifications to post/recipe. Did 1lb pork, 1lb beef-stuffed with pepper jack(all I had on hand)...made 16 meat balls. Will let you know the turn out......freezing now, browning in the morning. Totally wish I would've read the whole thing... I didn't freeze them :( hoping they turn out ok..